Getting into Digital Control of two or more trains on the same layout can be fairly expensive as you need to buy an expensive COMMAND unit. The loco's are slightly more expensive too, but once you have them, you can turn on lights, change crossing points, operate boom gates and control just about anything with the capability of a COMMAND unit. But what if you are just starting out? This project starts you out with the ability to control 2 loco's on the same track and it has the feature of automatically finding the address of each loco. All the operation of the project is contained in an 8 pin microcontroller. The project will accept either 12v DC or 9v to12v AC. The DC input is via separate terminals to avoid the loss of 0.6v + 0.6v from the diodes. DO NOT USE BOTH INPUTS at the same time. Use a 2 amp transformer to prevent a 1 amp transformer being overloaded. The project is designed to deliver up to 2 amps to the rails and this will allow two trains to be operated at the same time. RANu will get continual travel around the whole layout with 4 different directions of travel. Throttle 1 is on the main PC board. The second throttle needs to be a short distance away from the main board so the second operator can be in control his train with a clear view of the layout. Use any type of twin flex to join the two boards - no current flows through this.. Terminal A on the main board is wired to terminal A on the smaller PC board. The kit contains 2 alligator clips to clip onto the rails to allow you to quickly deliver current to operate the two trains. The kit also contains a slim PC board that fits between the sleepers and two rail connectors are slipped onto the rails and then soldered to the PC board. This makes a very neat connection. The PC board is placed in position and the rail connectors soldered to the board..
Don't forget, you are delivering 1 or 2 amps and the connection has be be soldered properly. 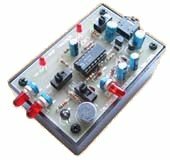 The POWER SUPPLY is the item that connects to the project and delivers either 12v DC or 9v to 12v AC. It is usually a transformer with a set of 4 diodes and an electrolytic (1,000u to 10,000u) contained in a box (or case) made from metal or plastic. This item converts the "Mains" (120v AC or 240v AC) to about 12v AC and the 4 diodes are connected in a BRIDGE to change the alternating voltage to DIRECT VOLTAGE and smoothed by the electrolytic. These items are contained in a plastic box or metal case so you cannot touch the 120v or 240v wires. This is called insulation or isolation and makes it safe to have the "mains" connected to the project. The current required for this project is between 1 and 2 amps. 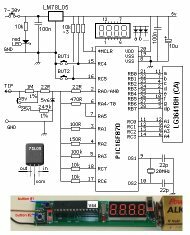 The actual current will be 1.1amps to 1.5 amps when both locos are accelerating and since power supplies are rated at 1 amp or 2 amp, we need to consider a 2 amp power supply. A 2-amp power supply can be very expensive or very cheap. 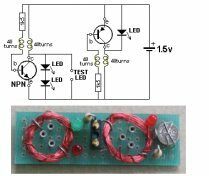 We have written an article on producing a low-cost power supply and you can read it HERE. You don't need to know the address of the loco's. The project automatically finds the address. To do this, place the loco on the track and slide the switch to FIND ON. Press the FIND button and the micro will advance through all the address locations and when the correct address is found, the loco will move. This will cause current to flow to the tracks and the current-sensor circuit will send a signal to the micro. The address of the loco will be stored in memory. Remove the loco and place the second loco on the track. Press the FIND button and the micro will find the address. Slide the switch to FIND OFF and place the first loco on the track and both will be activated by the two throttles. Add the carriages and the trains are ready. The address of the two loco's will be stored in memory and will remain in memory, even if the power is removed. Simply turn OFF the project when not needed and turn it ON again and the two trains can be controlled as before. 1 - PIC12F629 micro with "DCC"
Talking Electronics has a number of pieces of TEST EQUIPMENT to help in the design and testing of projects. Of course you can use a multimeter for most of the testing but some of the "tricky" faults need a special piece of equipment. You may only need a LOGIC PROBE once a month, but the project you are designing will come to a stand-still if you can't locate a problem. We designed all these projects because we needed them ourselves. Add one of them to each order you place with Talking Electronics and eventually you will have the whole range. Only responds to resistance less than 50 ohms. Ideal for digital projects as it tests connections very quickly. Detects HIGH and LOW signals on both TTL and CMOS circuits. The piezo allows you to hear low frequency signals and the signal injector (Pulser) will over-ride clock signals to make a circuit operate at a reduced frequency. See article for the complete list of functions. Tests transistors and shows the gain of the transistor. 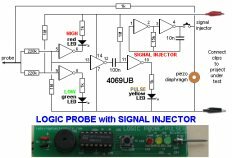 Also has Signal Injector probe. Tests PNP and NPN transistors and LEDs. Also teaches the amazing property of an air-cored coil in producing a high fly-back voltage. Detects 240v AC mains hidden in walls etc. Will also pick up RF signals from a keyboard to show you where Electromagnetic Radiation is coming from and giving you a headache. Traces cables when the power is OFF. Uses an FM radio to pickup beeps. 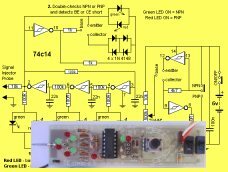 Teaches how an op-amp works by using pots to control the voltages on the two inputs. 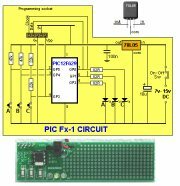 Learn to program PIC chips. Comes with a pre-programmed PIC12F629 chip with 3 routines. The cheapest CDU project you can get.